Amerie, N.O.R.E. Noreaga, Mavado & Roach, Serani, Vybz Kartel and more. 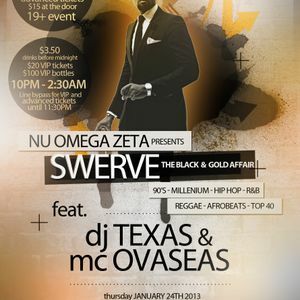 Nu Omega Zeta presents, Swerve: The Black & Gold Affair on Thursday January 24, 2013 at Club SeventySeven in Hamilton, ON. Music by DJ Texas & MC Ovaseas.